Wasem Alsabbagh received his bachelor of science in pharmacy from Damascus University, Syria in 2000. 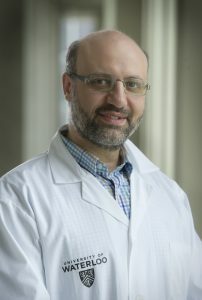 He received his Pharmacy Examining Board of Canada (PEBC) and Ontario pharmacist licence in 2006 and practised as a hospital pharmacist until 2008 when he started his PhD from the University of Saskatchewan. He received his PhD in pharmacoepidemiology and started his appointment with the School of Pharmacy, University of Waterloo in 2015. Wasem’s research focuses on administrative databases, pharmacoepidemiology, drug safety and effectiveness, and pharmaceutical care.